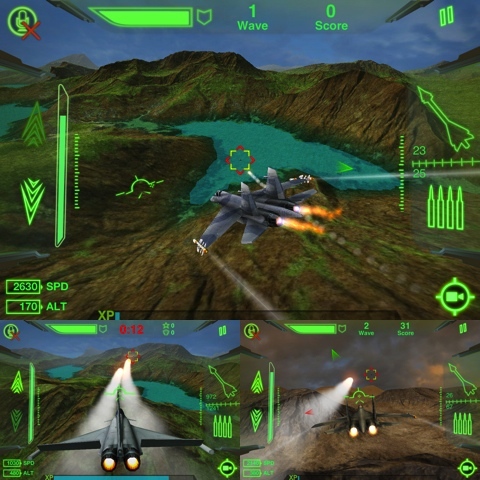 Air combat games are almost always a good time, and they’re even better when you put one on an iPhone or iPod Touch. The MetalStorm: Wingman app has been available on iOS for roughly a year, and it’s only gotten. It features Campaign, Versus and Survival modes, so there is plenty of replay value. With developer Z2Live still providing frequent updates and support, MetalStorm has all the makings of a great application. Starting out in MetalStorm, you’re given a brief tutorial that explains how the controls work. As you can probably imagine, the controls in MetalStorm are tilt-based. Bank right or left by tilting your device in that direction, and increase or decrease altitude by tilting your device forwards or backwards. You can perform evasive maneuvers by swiping in a direction on your screen, allowing you to avoid damage. Controls for missiles and cannons are located on the right side of the screen, and you can accelerate or decelerate with a slider on the left. Despite having so many elements, the HUD is actually very simple and doesn’t clutter the screen. Controlling the game is a breeze, and you can adjust the sensitivity of the tilt controls to your liking. Although there is a story to the campaign mode, most of the missions boil down to shooting down enemies within a certain amount of time. Surprisingly, this doesn’t take away from how enjoyable the title is. The gameplay has a way of never becoming repetitive, even if the missions are. The graphics and sound in MetalStorm are also very high quality. The environments aren’t particularly crowded; you’ll rarely see more than twenty or so objects on screen at one time. The presentation benefits from this: Objects are crystal clear, the frame rate is smooth and the music is epic. It’s a very immersive experience. Multiplayer is one of the more interesting features of MetalStorm. There are two ways to play multiplayer. You can have a friend fly along with you as a wingman during a mission, or you can hop into a Versus match against a friend or stranger. The Versus mode is simple enough. It has you and an enemy in an open airspace trying to shoot each other down. Connectivity is very smooth: I was playing on 3G using my Verizon iPhone 4 and never experienced a bit of lag. MetalStorm: Wingman is a free title on the App Store, and this review could go on for several pages discussing all of the great things about it. Although it relies on in-game purchases to generate revenue, you can still play the game without purchasing credits. 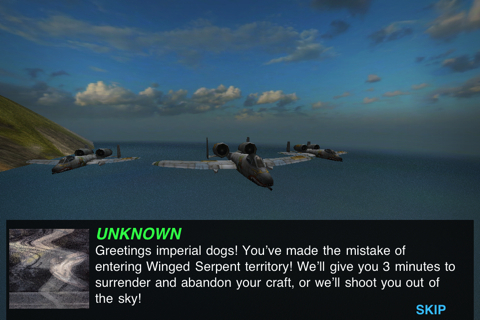 If you have even a passing interest in air combat games, MetalStorm is an iPhone app worth downloading. AppSafari review of MetalStorm: Wingman was written by Darius Reimm on March 2nd, 2012 and categorized under Action, Adventure, App Store, Fighter, Free, Games, iPad apps, Physics Based, Universal. Page viewed 7147 times, 3 so far today. Need help on using these apps? Please read the Help Page.